QUICK SUMMARY The story of Absalom’s shameful death, caught up in the mane of hair which was so much his image, is a parable of how not to do life. Absalom’s arrogance and rebellion is a picture of our sinful, independent state and where it leads. By contrast, the story of Jesus patiently explaining that the way to life is He Himself – like the bread that was shared out with no one excluded, and all able to internalise it, – so spiritually internalising Him and what He stands for is our choice to know God personally and receive His gift of life. That brings with it a new lifestyle, the life of the Spirit, which empowers us to say ‘no’ to traits which harms us and others, and to say ‘yes’ to the opposites, which are living and Christlike. The Way of God for us to imitate is to live in an attitude of love. We can do it because we are transformed and Spirit-empowered. 5 The king commanded Joab, Abishai and Ittai, “Be gentle with the young man Absalom for my sake.” And all the troops heard the king giving orders concerning Absalom to each of the commanders. “Be gentle” – whether out of fatherly love or a sense of guilt towards Absalom is not clear. 6-8 David’s army marched out of the city to fight Israel, and the battle took place in the forest of Ephraim. There Israel’s troops were routed by David’s men, and the casualties that day were great – twenty thousand men. The battle spread out over the whole countryside, and the forest swallowed up more men that day than the sword. “Forest of Ephraim” – not in Ephraim at all but an area east of the Jordan in Gilead, settled by the tribe of Ephraim. The larger army was unable to move effectively in the hazards of a forest, and fell prey to David’s experienced force. “Riding his mule” – the usual mount for the king’s sons, 2 Sam. 13:29. “Absalom’s hair” – what he gloried in, 2 Sam. 14:25-26, became the instrument of his downfall. As in life he had exalted himself with his own monument, 2 Sam. 18:18, in death he was thrown into a pit heaped up with rocks, like stoning, and a monument of shame. 15 And ten of Joab’s armour-bearers surrounded Absalom, struck him and killed him. “Joab’s armour-bearers” – David’s senior officer and his close support had conflicting feelings about the leader of a bloody rebellion. The narrator stresses, e.g. verse 5 above, David’s order to spare Absalom, but Joab had fallen for his deception before, 2 Sam. 14:1-24, and with the king’s safety in view, acted against David’s instructions. “Cushite” – “man from Ethiopia’, NLT. Joab had chosen an alternative to the priest’s son to carry the news, in case David overreacted. “If only I had died” – David had lost Absalom’s love and respect, and now he had lost his son and any possible reconciliation. From the tone of David’s exclamation, it appears that he is seeing what Nathan prophesied, 2 Sam. 12:10-11, is now happening – His sin with Bathsheba, repented of and forgiven by God, still has consequences which are now playing out. IN PRACTICE The story of Absalom’s death, caught in a tree by the long hair he so gloried in, brings with it a reflection on his way of life. He ingratiated himself with others, gained a following over and against his father, and even built a monument to himself just outside Jerusalem. It is a story of pride that leads to a fall, of man-centred values that can never play out well; a story of self-condemnation. In our sinful state apart from God, it’s how we all start. We can recognise the desire to be something for ourselves, and the rebellious streak. This is the ‘how not to” example that brings out the new life in Jesus, and the life of the Holy Spirit that empowers us to make positive choice and live differently – not needing people’s attention to boost our egos, but able to live for Jesus and even look a little bit like Him. QUESTION What stands out in the story of Absalom and his death that is the lesson for you? “I am” – there are a number of statements where Jesus refers to Himself using the words “I am”, purposefully making His hearers think of the Father’s words to Moses in Exodus 3:14, and prophetically through Isaiah e.g. Isaiah 43:25. This is the first of seven such sayings recorded by John. “The bread of life” – the crowd had said in verse 34, not getting it at all, “Always give us this bread” or ‘keep on giving us free food’. So Jesus makes it very clear He is speaking of Himself. “Began to grumble about Him” – The complaint recalls the attitude in the desert which was the root of the delay in entering the Promised Land. The synagogue crowd are showing the same inflexibility of thought and expectation – and lack of faith – as their ancestors who grumbled about the provision of manna. They consider that they ‘know’ He is the son of Joseph, miracle worker and possible national leader, and refuse to see beyond, to Him being the Son of the Father. • For further study, read Exodus 16:8, Numbers 14:27 and the recollection in Psalm 95:8-9. 44-45 “No one can come to Me unless the Father who sent Me draws them, and I will raise them up at the last day. It is written in the Prophets: ‘They will all be taught by God.’ Everyone who has heard the Father and learned from Him comes to Me. “No one can come… they will all” – the word ‘can’ is dunamai, which has the fuller meaning of ‘no one is able’. Jesus also quotes Isaiah 54:13 – His bigger vision is all being saved and coming to a knowledge of the truth, also the new covenant prophecy of Jeremiah 31:31-34. A balanced view holds these tensions of God’s election “no one can come… unless the Father… draws them” and “they will all” in man’s free will in responding to the tug of the Holy Spirit, in tension. This is a process of grace from God to us, to which we are divinely enabled to respond as the Holy Spirit works in our hearts. Scripture emphasises in different places God’s initiative of grace, and our responsibility of responding, in the initial spiritual transformation we call salvation or becoming a Christian. 46-48 No one has seen the Father except the One who is from God; only He has seen the Father. Very truly I tell you, the one who believes has eternal life. I am the bread of life. “No one had seen… the one who believes” – as in John’s prologue, John 1:18. If we simply accepted what we could see, that would not be faith. We are required to go out on the line of putting our trust in the goodness of someone we have not physically encountered. “Ate the manna… yet they died”. Manna gave them food at that time, but Jesus, the Living Bread, confers enduring life. “This bread is My flesh” – ‘this bread is Me’. Jesus is the true living bread who satisfies the spiritual hunger of those who believe in Him. In a more physical sense, He becomes this ‘bread’ by sacrificing His body – “My flesh” – to death on the Cross. His perplexed hearers would reflect on this and some would later understand. IN PRACTICE The crowd who heard Jesus give this teaching didn’t find it easy to grasp. Many of them had known Jesus for 30 years. But recently, they had seen miracles of healing and provision which pointed to a different kind of identity, His divine Messiah identity, which He was now explaining to them. Some had faith to see Jesus beyond the carpenter’s shop, while others struggled. It’s the same with us. Every encounter with God requires two things of us: our need of God (depending) and taking Him at His word (believing). John doesn’t use words like ‘faith’ and ‘trust’ but prefers the action word ‘believing’. Jesus, not our efforts or good deeds, is the source of empowered life now and the way to life eternal. He chooses us, reminding us that He does out of love for us, and hold out an offer. When we trust Him for that offer, everything changes. QUESTION How would you explain to someone else simply, what Jesus had done out of love for them, and how they might respond to that? The hallmark of those who belong to the Lord, who is Love personified, is that they walk in love like Him. Each of you must” – in the context of, each of you, redeemed by Jesus, empowered by the Holy Spirit, is now enabled to live like this. A list of five instances follows, each with an aspect not to do, an aspect to do positively instead, and a spiritual principle. “Put off falsehood” – twisting of the truth comes with anger and bitterness. The emotional response of anger (like any emotional response of the moment) is not of itself sin, but anger that takes root i.e. carries over to the next day and beyond forms a resentful, bitter and often slanderous attitude that is the visible effect of unforgiveness – and that is denying the gospel. “A foothold” – all sin gives the devil legal rights to oppress us and the sin of unforgiveness and unresolved conflict is perhaps the most common strategy the devil uses to gain a measure of control over our thoughts and lives. Sin is the access he looks for. …Anyone who has been stealing must steal no longer, but must work, doing something useful with their own hands, that they may have something to share with those in need. “Steal no longer but… work” – repentance can be defined as stopping something harmful, starting something positive instead, and a changed lifestyle that all can see. 29-30 Do not let any unwholesome talk come out of your mouths, but only what is helpful for building others up according to their needs, that it may benefit those who listen. And do not grieve the Holy Spirit of God, with whom you were sealed for the day of redemption. 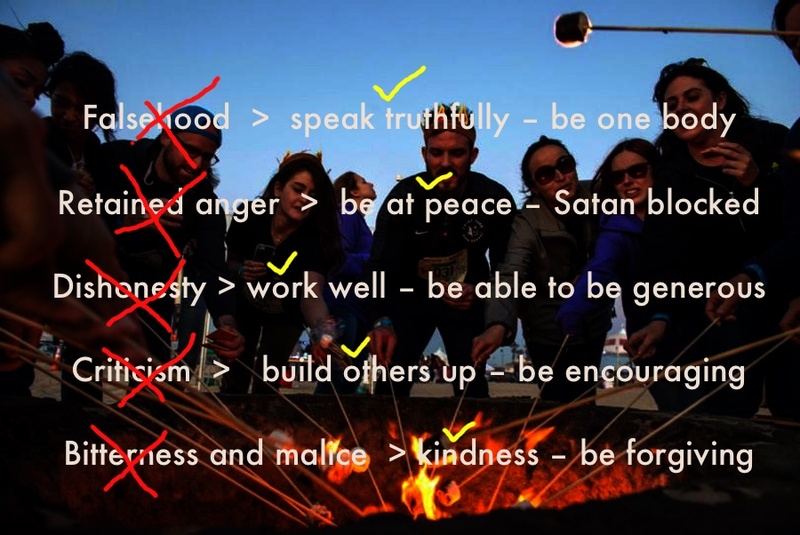 “Only what is… building others up” – a practical guideline and the opposite of obscene language, gossip and slander which like a rotten fruit spreads and corrupts, doing so much damage to individuals and the whole community. 31 Get rid of all bitterness, rage and anger, brawling and slander, along with every form of malice. “Bitterness…anger” – resentment and malice have no place in people who have been forgiven of much -– and so morally cannot withhold from others that same grace. Failure to forgive results in the anger, clamour and malice which follow logically in the sentence. “Be kind” – be kind, chrestos, because of Christ, Christos. “Compassionate… forgiving – the opposite of the bitter attitude. God’s forgiveness of us is the standard we apply to others: “Forgive us our debts as we also have forgiven our debtors, Matt. 6:12. For further study, compare with Hosea 3:1, Colossians 3:13. Eph. 5:1-2 Follow God’s example, therefore, as dearly loved children and walk in the way of love, just as Christ loved us and gave Himself up for us as a fragrant offering and sacrifice to God. “Follow God’s example” – more literally, “Be imitators of God”. Believers have been exhorted to learn about Christ, and not to grieve the Spirit, Eph 4:20-21, 30. Now they are set the challenge of adopting and demonstrating God’s values to the world around them. “Walk in the way of love” – a summary of the section. Christ’s demonstration of loving us was fragrant, i.e. acceptable to God; our fragrant offering is following His example in walking in love towards others. IN PRACTICE The new life which comes through asking Jesus to be Lord of our lives is – new. ‘The old has gone, the new has come,’ in Paul’s words elsewhere. Foul language and petty dishonesty doesn’t seem clever any more. A lot of our more selfish traits lose their hold on us. But there’s plenty of baggage we need to recognise and lay down, and Paul sets out some choices for us – what not to do, what to do positively instead and the spiritual principle involved. In the flesh, or selfish nature, we can be harsh and critical of others, with standards of behaviour that don’t align with our new spiritual identity. This ‘mixed message’ destroys our witness but more seriously, offends the Holy Spirit and causes Him to distance Himself. Someone whose very nature is love is going to be a sensitive person, and the Holy Spirit is that sensitive person. On the other hand, He is the very One who enables us to grow more Christlike and loving. There’s a part we do, but we cannot do it by ourselves – we need to work with His empowering. QUESTION Out of the “get rid of” things listed and the challenge to love unconditionally, like Christ, which speak to you most? PRAYER Father God, as we come to You in Jesus, we are so grateful for the new life You hold out to us. Jesus, You are the Bread of Life! Help us to grasp this with both hands, eagerly, and with the help of Your Spirit, to live it out for all to see what You have done. Amen.